EghtesadOnline: As per an agreement signed between Iran, Russia, Azerbaijan, and Turkey on the sidelines of Bakutel 2018, the four sides will establish startup centers with a joint investment of $2 million to expand technological collaboration. The 24th Azerbaijan International Telecommunications, Innovations and High Technologies Exhibition and Conference, Bakutel 2018 was held on Dec. 4-7 at the Baku Expo Center. On the sidelines of the event, Iran’s ICT Minister Mohammad Javad Azari Jahromi met with his counterparts from Russia, Azerbaijan, and Turkey, respectively Konstantin Noskov, Ramin Namiq Oglu Guluzade, and Mehmet Cahit Turhan. According to the Iran ICT Ministry website (ict.gov.ir), during the talks between the four ministers, an agreement was signed to set up startup centers. The centers are to connect knowledge-based companies and startups from the four nations and help build technological cooperation, Financial Tribune reported. Jahromi pointed to earlier talks held between the Iran, Russia, Azerbaijan, and Turkey over the establishment of a joint ICT market on the sidelines of the TurkmenTEL 2018 in Ashgabat in October, and the International Telecommunication Union's 20th Plenipotentiary Conference two weeks ago in Dubai. As per the earlier meetings, national currencies of the countries could be used for trade in the proposed market. The joint market would initially be regulated by governments and later oversight delegated to the private sector. During the meetings in Baku, the Turkish Minister Mehmet Cahit Turhan called for closer collaboration between the countries in postal services and cybersecurity. Russia’s Minister of Digital Development, Communications and Mass Media Konstantin Noskov welcomed the prospect of establishment of the joint startup center and called on Jahromi and the government in Tehran to prepare the legal groundwork for the project. He said a final agreement can be signed between the four countries in the near future. Jahromi invited his three counterparts to meet in Kish Island in the Persian Gulf for further talks. During his visit to Baku Jahromi conferred with President Ilham Aliyev. The Azeri leader said prospects of expanding tech ties between the two neighbors is promising. The INSTC is a major transit route designed to facilitate the transport of goods from Mumbai in India to Helsinki in Finland, using Iranian ports and railroads, which the Islamic Republic plans to connect to Azerbaijan and Russia. The corridor will connect Iran with Russia’s Baltic ports and give Russia rail connectivity to both the Persian Gulf and India’s rail network. Jahromi thanked Aliyev for his support, which has helped boost technological collaboration between the Iranian and Azeri telecom ministries and briefed him on bilateral projects carried out between the two neighbors. 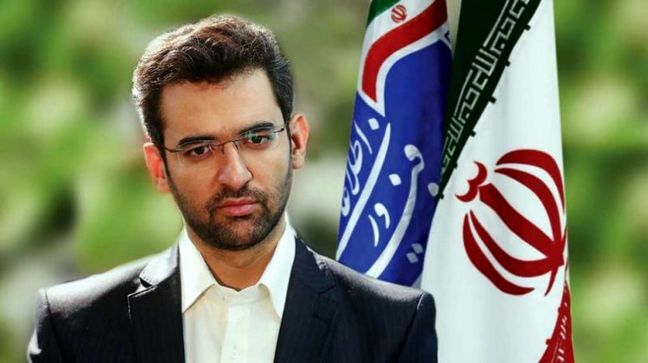 The minister suggested a joint project between Iran and Azerbaijan to design and launch remote sensing satellites. Commenting on Iran’s progress in space sciences, Aliyev welcomed the proposal and called for effective cooperation in the ICT sector, including cybersecurity ties. 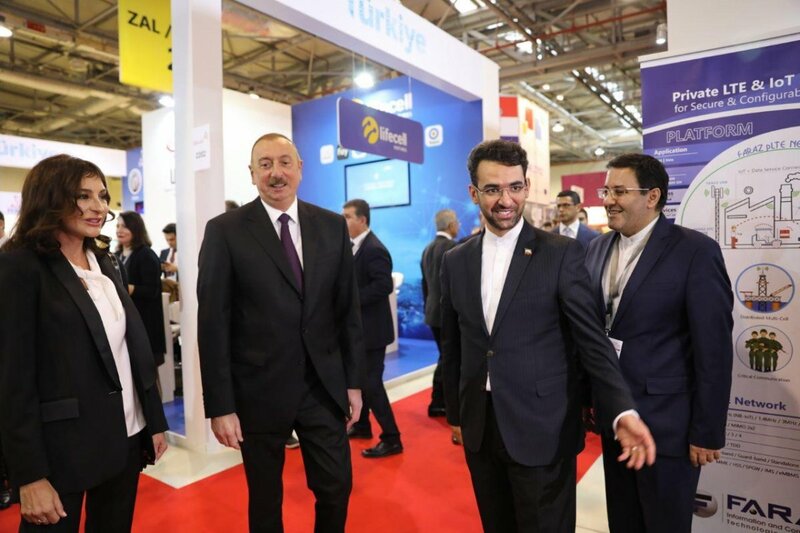 Aliyev and the Iranian minister visited the booths of Iranian knowledge-based firms and startups at Bakutel 2018. Over 200 firms from 20 countries including Belarus, China, Croatia, Georgia, India, Italy, Poland, Russia, Slovenia, Turkey, Ukraine, the UAE, and the US participated in the Baku event. In addition to the Iranian Space Agency and the Telecommunication Infrastructure Company of Iran, 11 knowledge-based companies from Iran attended the event.